Stopping by hibiscus buds,Kalbu Park. What a colorful mosaic Shantana. The red really pops against the green. Hope you have a very nice week. Beautiful mosaic, Shantana... Hibiscus blooms are so pretty --especially the buds. Very, very pretty! I don't think I'd have come up with the idea of using hibiscus buds for a mosaic even if I racked my brain!! Wow!! Very pleasing in the eye! Beautiful. Love the softness around them as well. Bet they're going to be something when they open. Hopefully that will be another mosaic you share. Very beautiful - I love to take bokeh flower shots too. Happy MM! Wow!!! Beautiful mosaic...love the hibiscus!!! Lovely mosaic! Those flowers and little buds look like they are floating. Very great bokeh! They remind me of tight rose buds. I love the Mosaics you post. What a great idea! So wonderful..it's like nature's lipstick! 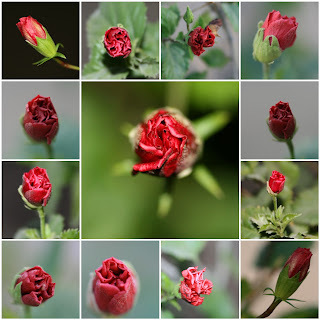 Fantastic colection of hibiscus buds!! Very pretty the Hibiscus buds, different. We tend rather to photograph the open flowers as they are so vibrant and exotic. The Hibiscus have such a nice texture and one can see this as well on the buds. Not long and your baby daughter wants a camera. At the moment she seems to be happy to try and catch the butterflies. This Muscat area looks wonderful, very picturesque, mmhh.. and yummy fresh dates! What beautiful photography and mosaic! I enjoyed looking around your blog at all the lovely photos. I have had such an enjoyable time looking through your blog, we have so much in common with wildlife and photography. I love your rollers and kingfishers, 2 of my favourite birds.So pretty! I love all these shots in your mosaic - very pretty! How very pretty, a lovely mosaic! ...beautiful. I love seeing the buds just about to open!